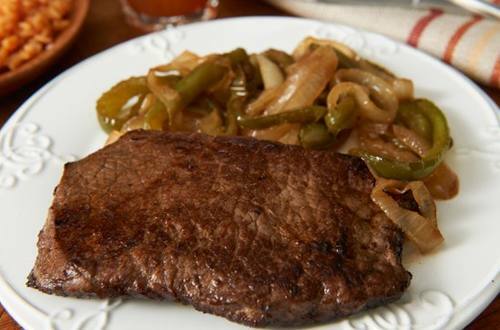 1 Sprinkle Knorr® Beef flavor Bouillon evenly over steak. 2 Heat 1 tablespoon oil in large skillet over high heat. Add steak, in batches, and cook about 40 seconds on each side or until desired doneness. (Be sure not to overcook so steak stays juicy.) Remove and keep warm. 3 Heat remaining oil in same skillet and cook onions and peppers, stirring occasionally, until browned. Serve steak with vegetables and rice.